Saoirse Ronan may have been born in New York, but she was born to Irish parents and spent most of her life growing up in Ireland. The 21 year old actress has been acting since she was nine years old, and at the age of 13 she became one of the youngest actresses to ever be nominated for an Academy Award for her role in Atonement. Her latest film, Brooklyn, opens this weekend, and in it she plays an Irish immigrant in 1950s Brooklyn who is eventually forced to choose between two countries, and the two different men in her life. It’s a role that may very well see her receive a second Academy Award nomination. Recently we had a chance to sit down with Saoirse in a press junket for the movie. What made you decide to make Brooklyn? I felt very ready to play a young woman who was in the same sort of place personally that I was in. I also really did want to play an Irish person and I really did want to do an Irish film, but a good one, and one that I felt kind of captured who we were and our spirits. It was also intelligent and intelligently written and all the rest. Were you ever tempted to change the script to make it feel more real? No, the only thing that I wanted to change was every time she’d say the word, she’d refer to her mother, it would be written as mum and somebody from that background and in that town wouldn’t say mum. So that was the only thing that I wanted to change. I wanted to change it to mam, that was it. I’m not somebody who really likes to change things anyway. I feel like if I sign onto a script it’s because I love it and I believe in it. How does your character (Eilis) change throughout the movie? She takes a huge, huge step by moving to New York and it’s something that initially wasn’t her decision. Her sister was the one that set this up for her. She moved over there. There was a house set up for her already, there was a job waiting for her which was incredibly lucky, but at the same time this was all somebody else’s doing. And I think the turning point in her experience in New York is that she started to take hold of her own life. So that’s what New York gives her. And it’s all very nuance, very subtle, this change that she makes. Even in her fashion, even the clothes that she wears and how she speaks to men is very different by the time she comes back home. And I feel like you really only notice that change when she comes back home. Ireland has stayed the same, nothing’s really changed but she has. Do you think Eilis loves Tony? I do think she loves Tony. I don’t think she’s moving as quickly as him, and I think like a lot of young men around that age, they feel something and they commit to it, and I think for her, she’s still finding her way in this new place and adjusting to this new role in a different city for herself. I think she does need to take a step back and she does need to go back to Ireland in order to realize that this is the life she wants. But really what I like about this is that it’s not black and white. John said this to me in rehearsals and it’s the main thing that has stuck with me the whole time even after we made the film is that it comes down to her going through enough life experience to be able to make a choice, to be empowered enough and to be experienced enough in life to make a choice and that’s really what it’s about. As discussed, your character goes through a huge change, but movies are hardly ever filmed in order. How did you decide what stage your character was at when you were filming your scenes? It was John (Crowley) really, it was nothing to do with me. He was just very in tuned with where the characters were at each point from scene to scene. He would know exactly emotionally where they should be on that arc that she makes. It was down to him just like keep me focused I guess and he noticed everything. You couldn’t get away with anything. He would notice every little thing that you did and where you would need to tweak or somewhere where you’d need to bring more sense of humor into it or whatever it was. It was great because it just kept me on my toes the whole time and I think the rest of the cast feel the same way. So it was down to him. In the end, do you think Eilis makes the right decision? As I said, it wasn’t as black and white as she loved Tony and she didn’t love Jim. Both options were kind of lovely, but you don’t know whether she’s made the right choice or not. We’ll never know if she’s made the right choice and she won’t know but the fact that she’s made it is what the film is about. Photo by Kerry Brown. Courtesy of Mongrel Media. 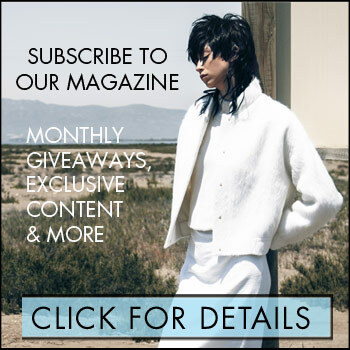 Get the hottest fashion, beauty and celebrity updates from the week's top stories, enter exclusive subscriber giveaways and be the first to receive the full digital version of REAL STYLE magazine.